York County, located in the South Central Region of Pennsylvania, contains over 900 square miles of terrain ranging from relatively flat stream valley areas that gently roll to uplands. The County is a balanced community of both urban and rural experiences. Its rural landscape with rolling hills and fertile farmland is still an integral part of the area. York County is the home of Pennsylvania’s largest county park system consisting of 4,000 acres. Eleven state and county parks, four large lakes, a major river and numerous streams and creeks offer a paradise for outdoor activities. York County is the heart of Pennsylvania’s most popular tourist region. Our extensive transportation network, coupled with the quality and quantity of lodging options make York County the perfect destination for a central Pennsylvania vacation. It is divided into five district regions, each with its own towns and personality: the regions York City, Greater York, Northern York County, Southern York County, and Hanover/Southwestern York County. 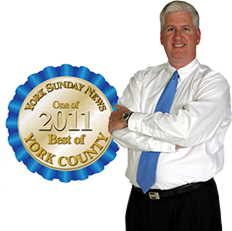 The largest municipality in York County is the City of York, the County seat. Offering the cultural attractions of a big city and the down home charm of a small town. Not many cities of York’s size (just over 40,000 residents living within 5.3 square miles) can boast of two downtown farmers’ markets, 24 parks, a premier performing arts center, an elegant National Trust Historic Hotel, a liberal arts college and university, a top-flight downtown library, six museums and a Visitor’s Center, a symphony orchestra, downtown access to a 42 mile nature and jogging trail, and 34 outdoor murals. The townships around York City are the most populated and include Springettsbury, York, Spring Garden, Manchester, and East and West Manchester Townships. These communities all draw a heavy influence from York City, and many residents work in and around York. In these townships you will find the greatest number of business and retail outlets. The region encompassing the northern sections of York County reflects more of the Harrisburg area. Many of the neighborhoods serve as bedroom communities for people who work in Harrisburg or in the towns in Cumberland County, west of the Susquehanna River. Southern York County has experienced a growth boom mainly due to residents who work in Baltimore and northern Maryland but prefer the quality of life available in York County. York County’s second largest town is Hanover Borough, located in the southwestern section near Adams County to the west and Maryland’s Carroll County to the south. With a population of 14,000 Hanover has its own unique personality. York County has seen unprecedented growth and popularity, making it a wonderful choice in which to live, work, and open or expand a business. York County and South Central Pennsylvania have long benefitted from dynamic economic growth and is the third fastest in population growth in the Commonwealth. York County leads the Commonwealth of Pennsylvania in new home construction; in addition the York/Hanover region is the fastest growing in the Northeast. Population has increased from from 238,336 in 1960 to 421,049 in 2007. The principal development area in the County encompasses the City of York and adjacent municipalities, and accounts for nearly half of the population. An equally dynamic but smaller development area centers around the Borough of Hanover. York County ranks sixth in the state in manufacturing. Some of the better known manufacturing firms include Johnson Controls, Inc., Harley-Davidson Motor Company, BAE Systems, Graham Packaging and Campbell Operations/Cooper Hand Tools. Church & Dwight Co., Inc., maker of Arm & Hammer® brands, is constructing a new laundry detergent manufacturing facility and distribution center. It will occupy 1.1 million square feet of building space on 232 acres and will feature a state-of-the-art design for energy use and waste reduction. Agriculture is important to York’s economy. In addition to providing an abundance of farm products for local and regional consumption, farming in York County supports a wide range of food processing industries-potato chips, snack foods, baked goods, and canned and frozen vegetables. Ice cream and other dairy products are among the many foods processed at Rutter’s Dairy in York County. Welcome to York County, a land of beauty and contrast. Much of York County is still open land, making it an ideal setting for housing. Housing costs here are lower than in many regions of the country. New developments, especially in southern York County, make it easier for commuters the Northern Maryland to enjoy a lower cost of living and scenic views. Charming farm-houses and village-style homes are also available and set the stage for a relaxed lifestyle. The average single-family home in York County is $225,000. Pennsylvania is one of the most popular retirement states, with independent and assisted living as well as elder care facilities. Suburban neighborhoods make life convenient, yet farmland, lakes and other natural attractions are never far. Neither are Harrisburg, our state capital, and many exciting destinations like Philadelphia, Baltimore’s Inner Harbor, Lancaster’s Amish Country, and Gettysburg. York City is enjoying a renaissance. A growing restaurant and arts district, along with beautiful architecture and wrought iron, invite strolls along Market Street, and historic murals decorate downtown structures. Living in the city holds many attractions, and, as with exurban areas, housing is affordably priced.